Included in today's third quarter financial results, Royal Caribbean confirmed that it is in negotiations for the possible construction of a third Oasis class cruise ship that would delivered in middle to late 2016. Royal Caribbean has not entered into any sort of agreement at this time, it does hope to place an order by the end of the year. 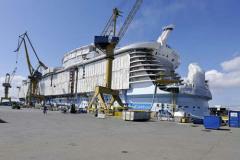 The new ship is expected to cost less on a per berth basis than either of the first two Oasis-class vessels. Royal Caribbean chairman Richard Fain confirmed the news during his talks, "The Oasis of the Seas and Allure of the Seas have proven themselves to be exceptionally attractive ships by generating the highest guest satisfaction ratings in the fleet coupled with very compelling financial returns. Ordering another such ship for delivery in 2016, at a lower cost, with better energy efficiency is very consistent with our balanced goals of prudent growth, return improvement and debt reduction." This third Oasis class ship would be in addition to the other two Sunshine Class ships Royal Caribbean has already ordered and is in the process of being built.